Co-sponsored by the Center for Information Technology Policy (CITP), the Program in Law and Public Affairs (LAPA), and the Woodrow Wilson School of Public and International Affairs (WWS). Free and open to the public. 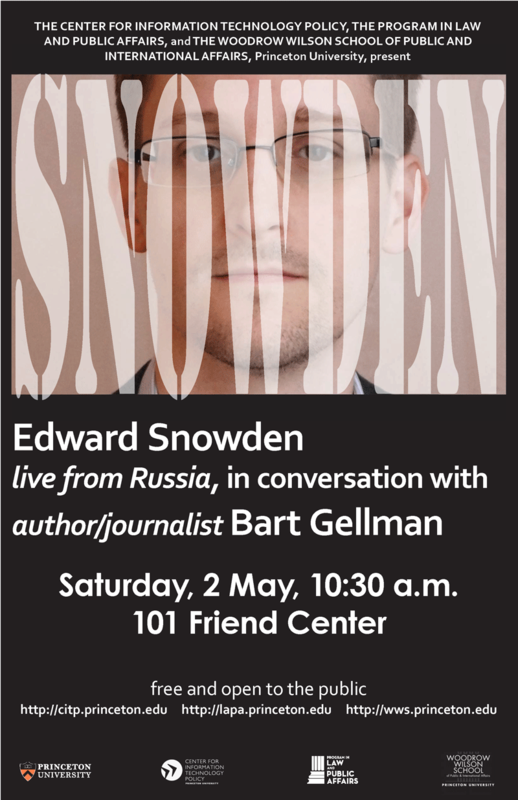 CITP, LAPA, and WWS are hosting a live conversation between Edward Snowden (in Russia) and Bart Gellman (in Princeton). Since June 2013, author and Pulitzer Prize-winning journalist Gellman has written stories for The Washington Post about the National Security Agency (NSA) documents provided to him by former NSA contractor Snowden. 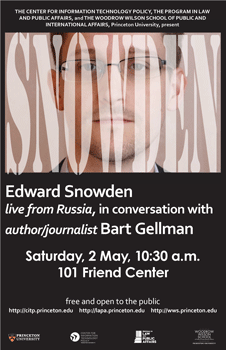 This conversation will focus on the impacts of Snowden’s actions over the past two years. Edward Snowden is a former NSA contractor who collected classified documents regarding NSA surveillance practices and provided those documents to journalists. The subsequent disclosures have provoked international debate over privacy and national security. He was recently the subject of the Oscar-winning documentary film Citizenfour. Barton Gellman is an author and journalist who holds appointments at Princeton University as Lecturer at the Woodrow Wilson School of Public and International Affairs and Author in Residence at the Center for International Security Studies. He is also a senior fellow at The Century Foundation. His professional honors include two Pulitzer Prizes, a George Polk Award, a Henry Luce Award and Harvard’s Goldsmith Prize for investigative reporting. Gellman graduated with highest honors from Princeton and earned a master’s degree in politics at University College, Oxford, as a Rhodes Scholar. Media inquiries should be directed to Elisabeth Donahue, edonahue@princeton.edu, 609-258-5988.